Manilkara zapota, commonly known as the sapodilla or sapote or sapota is a long-lived, evergreen tree native to southern Mexico, Central America and the Caribbean. 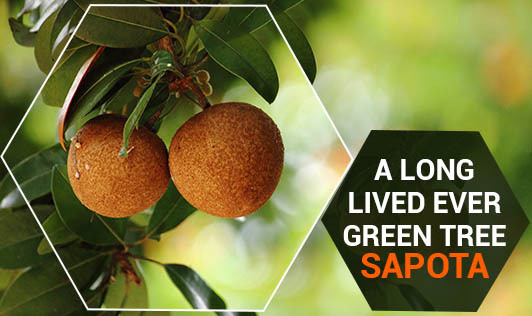 Sapota, also called chiku, is a kind of fruit mainly grown in India for its health benefits. This tropical fruit contains many vitamins, minerals and antioxidants. 1.Sapota comprises of antioxidant vitamins such as vitamin A and vitamin C. Vitamin A helps to ensure proper vision, maintaining healthy skin and mucus membranes and also offers protection from oral cavity and lung cancer. 3.Chiku contains rich dietary fiber (2.6g/100g) making it a good laxative. Fibers in ripe, sweet and tasty chiku fruits help to prevent constipation. 4.Taking sufficient quantity of ripe chiku in raw form or as chiku shake will protect colon system preventing chances of colon cancer. 5.Sapota contains the polyphenols compound tannin, which has been shown to have powerful antibacterial, anti-parasitic and antiviral effects. 6.Tannins also have anti-inflammatory properties and assist to eliminate health conditions like Irritable Bowel Syndrome and erosive gastritis. •The flesh may be scooped out and added to fruit cups or salads. •A dessert sauce can be made by scooping the flesh of the sapota and adding orange juice, and topping with whipped cream. •Sapota flesh may also be blended into an egg custard mix before baking. •Mashed sapota pulp can be added to pancake batter and to ordinary bread mix before baking.